To some case manufacturers, the most important thing is ensuring their products are on sale before anyone else’s, which is why British retailer MobileFun is already offering a bunch of protective solutions for the unreleased Nexus 5 — weeks before the handset even gets its official unveiling. 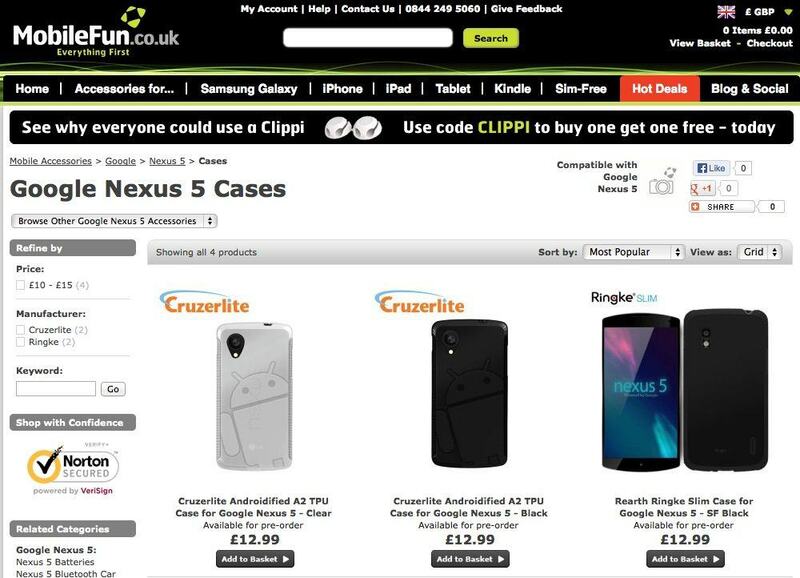 There are four cases on offer — two from Cruzerlite and two from Rearth Ringke, with prices starting at $17.49/£12.99. None of them are shipping just yet; they’re all available to pre-order, and it’s unclear when they’ll be available. But all are designed to fit the “Google Nexus 5,” which is yet to actually be confirmed by Google. But of course, it doesn’t need to be, because we already know pretty much all there is to know about this device. Last week, a full service manual for the new handset was leaked online. It was later pulled at the request of LG, but not before case makers like these had a chance to take down its specifics. In addition to its measurements, the service manual revealed the Nexus 5’s internal specifications, including its 4.95-inch 1080p display, a 2.3GHz quad-core Snapdragon 800 processor, 2GB of RAM, and an 8-megapixel rear-facing camera with optical image stabilization. According to a report from this morning, the device will be available in both 16GB and 32GB variants, and each device will have a different battery capacity: 2,300mAh and 3,000mAh respectively. Prices are expected to start at $299 for the entry-level model and rise to $399 for the high-end model. We’re expecting Google to announce the Nexus 5 at the end of this month, so we shouldn’t have too long to wait until all of this becomes official.